The RoboLobster prototype is about two feet long, has eight legs and weighs about seven pounds on land. Researchers learn lessons from nature. Biologists and engineers are melding their expertise to develop robots that look more like a high-priced dinner than a high-explosive detonator. Taking their cue from nature, scientists are designing a sensor-toting techno-crustacean that can operate in sandy, rocky, undulating environments. For military troops, these devices could alleviate the hazard of underwater mines during beach landings and littoral zone operations. While the field of biomimetics is not new, it continues to expand because it offers what engineers call existence proofs for capabilities that could be included in man-made devices. High-tech versions of natural wonders feature the attributes of living creatures but with a bionic twist. Strictly speaking, the Wright brothers were among the leading biomimeticists of the past century. Today, engineers are exploring nature to find solutions to some of the military’s toughest challenges. Because mines are an inexpensive and efficient way to limit access to specific areas, they are one of the most insistent problems the U.S. Navy and Marine Corps face. Several years ago, military researchers reasoned that perhaps the best way to hunt for mines in shallow and surging waters was to build robots that mimic the sea creatures that forage for food there. After all, both tasks require the same type of mobility. Equipped with sensors, a robotic platform could be used to explore areas such as river bottoms and surf zones. The work began in earnest at the Office of Naval Research (ONR), Arlington, Virginia, and then moved to the Defense Advanced Research Projects Agency, then back to its current home at ONR. Although the animal kingdom presented several alternatives, lobsters appeared to be the best fit for a number of reasons. Joel L. Davis, program manager of the RoboLobster project, ONR, explains that lobsters move and operate not only on sandy bottoms but also in rocky, cavelike environments. In addition, lobsters are easy to study because the nervous system that drives their muscles to walk and turn is simple. 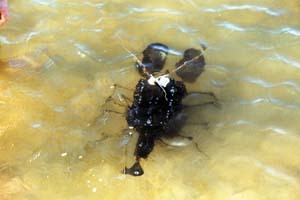 During the past several years, researchers have plotted the signals to the muscles of a lobster, so data is available. “We have a library of behaviors, and we have the signals that are necessary to drive these behaviors. Can we instantiate this in an artificial animal? Now we’re getting into bioengineering,” he states. To pursue this research path, the U.S. Navy enlisted the expertise of Dr. Joseph Ayers, who is currently an associate professor in the biology department at Northeastern University in Boston. Ayers, who has been studying lobsters since 1970, had uncovered how lobsters are able to continue to move and function even in surging waters. In the early 1990s, he started developing a sonar biotelemetry system and developed a finite state machine that demonstrates how lobsters walk diagonally. The most challenging part of building a robotic lobster, Davis says, is figuring out what mechanism to use to move the legs and other appendages. Although researchers know what kind of signals to send, they must determine the best servo to employ to actually move the legs. Once the best approach is determined, it also can be applied to other robotic platforms, which opens up many possibilities, he adds. Davis explains that since work on the project has returned to ONR, funding has been split. Ayers is receiving a small grant to continue his research, and he is working with Merlin Technologies, Boston, to redesign the previous version of his robot lobster. In addition, Ayers will be collaborating with the company to build a new prototype. “One of the big issues for underwater robots is that real underwater animals are only slightly negatively buoyant. So, for example, a seven-pound lobster weighs about 12 ounces when it’s under water. They get around by using their claws and tail as hydrodynamic control surfaces. What they’re really looking for is traction because they weigh so little in the water that as soon as they experience any surge, they slide around on the bottom,” he explains. 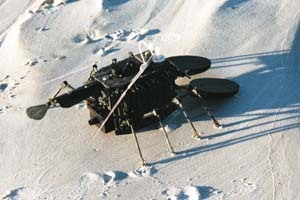 Adding weight is not an option because that would require more energy and repeated movements could cause the robot to get stuck in the sand. As a result, Ayers’ lobster models feature eight legs rather than six, providing 33 percent more traction. Massa Products Corporation, Hingham, Massachusetts, is receiving the second part of the funding and will use it to begin manufacturing a robotic platform affectionately called RoboLobster. The company is taking the prototype created at Northeastern University, simplifying and ruggedizing the design as well as addressing power requirements to move it into the production stage. These limited production models will be turned over to naval personnel who will conduct field trials, Davis explains. Building the RoboLobsters is only the first step. The second is determining how they would be deployed. One possible approach would be to release four or five RoboLobsters in a designated zone. Each would be preprogrammed to explore the region in a semi-random fashion, Davis states. When a RoboLobster detects an unknown object or suspicious device, it would relay the information to military personnel on the surface. If inexpensive enough to be disposable, each device could be rigged with a small explosive charge, and an operator could signal it to explode, detonating the mine, he says. Massa Products, which has a history of working with the Navy that dates back to World War II, is proposing placing sonar markers to delineate a particular area for each RoboLobster to explore. Eventually, the devices may be able to communicate with each other, so one device could signal to another that it has crossed an invisible boundary and should move, Davis relates. Once the RoboLobsters have completed their search mission, they could be signaled to self-destruct or perhaps congregate in a certain location where they would be retrieved, Davis explains. “There’s no show stopper here. There’s no reason that it can’t be done. It’s difficult to get GPS [global positioning system] underwater, but there are other ways of doing this,” he says. 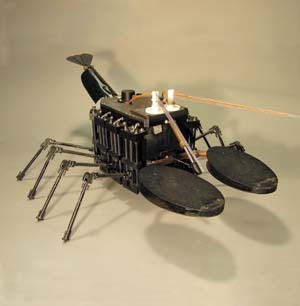 Just like a real lobster, the RoboLobster has been designed to operate in water and on sand. This versatility will allow the military to use the device in different types of environments to conduct reconnaissance, mine detection, and search and rescue missions. The RoboLobster could be considered autonomous in that the legs will feature preprogrammed sensors that tell the device to stop moving when it encounters an object, Davis says. However, they would not be totally autonomous because the command to self-detonate, for example, would most likely come from personnel on board a ship. Among the technologies the RoboLobster could carry would be sensors that would detect metal, chemicals, explosive signatures and plumes of other underwater vehicles. A prototype that already has been used in demonstrations features a video camera; however, the effectiveness of this capability depends on the available light, Davis points out. Massa Products currently is beginning to fabricate some devices, and tests have been conducted in the areas of manufacturing, waterproofing and movement techniques. Davis predicts that it will take two to three years before a dozen RoboLobsters are ready to enter the testing stage. Ayers shares that the principal problem in designing a robot lobster is not mobility. Finding a way to imitate the behavior of a lobster is the biggest challenge. “We have a behavior set that we understand quite well. My real goal is to come up with a control architecture that can realize that behavioral set,” he explains. “What truly differentiates robots from animals is that when robots get stuck, they’re stuck. When an animal gets stuck, it can wiggle and squirm and get out of whatever tight spot it got stuck in. We think what the animals are doing is increasing the level of chaos in the neural circuits that would otherwise generate locomotion such that they generate variations on the locomotoring pattern, which constitutes the wiggling and squirming. So if we can build a controller for a robot that has variable chaos, we should be able to build a robot that can wiggle and squirm out of tight spots,” Ayers says. The cost of individual units will need to be resolved because the commercial market for such devices is limited, Davis notes. Perhaps companies that install underwater pipelines or cables would be interested in a product such as the RoboLobster, but there are few other obvious applications, he states. Davis reveals that work on this project, as in many basic research programs, has involved a clash of two cultures that he finds very interesting. For example, scientists like Ayers believe that alloys such as nitinol should be pursued as the material for building platforms like the RoboLobster. Nitinol expands and contracts so it resembles a muscle. Manufacturers, on the other hand, believe that this type of material is too experimental, so they prefer to use a more traditional approach that includes gears and wires. It is ONR’s responsibility to resolve these kinds of differences, and it is not always a simple process, Davis notes. Industry can support biomimetic research in several ways, Davis says. Some companies are researching ways to make artificial muscles using polymers, and Davis believes these firms are going in the right direction. If a material could be developed that mimics invertebrate muscle tissue, all kinds of possibilities could open up, he adds. Biomimetics extends beyond robotics, Davis points out, and the applications are likely to grow as well. Electronics already are implanted within humans—for example, heart pacemakers and cochlea implants—he notes, and experiments have been conducted with implanting artificial retinas. Davis predicts that perhaps years from now enough knowledge will be gained to connect hardware devices to brain tissue.